Catholic Schools’ Week begins on Sunday 27 January 2019. 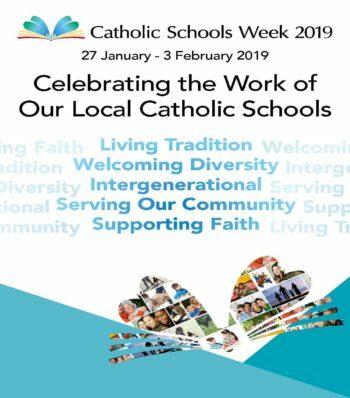 During Catholic Schools’ Week 2019 we will focus on the theme of: Celebrating the Work of Our Local Catholic Schools. This will include a special acknowledgement of the contribution grandparents make to family life. We wish to recognise the role of grandparents by celebrating Grandparents’ Day in Mary Queen of Peace PS on Friday 1 February (St. Brigid’s Day). Grandparents, parents and family members are invited to join us for mass in the church at 9 a.m. Following mass, we would like grandparents to return to the Parish Centre, where we will have refreshments (courtesy of the PTA) and a special grandparents’ assembly by Mrs McLouglin’s Y7 class, as well as a display of the children’s work. During Catholic Schools’ Week we will remember in our prayers deceased grandparents. We know that in some families there are other special family members who play an important role in the children’s lives. You are very welcome to invite special family members to the mass and assembly as well. The children have a special invitation to deliver to their grandparents. A copy of the invitation can also be downloaded. We look forward to seeing everyone on Grandparents' Day.